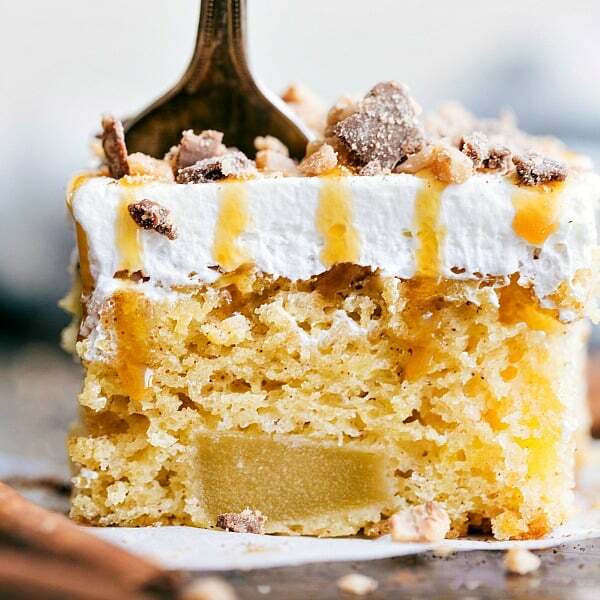 Caramel Toffee Apple Cake is a tender and moist cake with apples baked right inside! 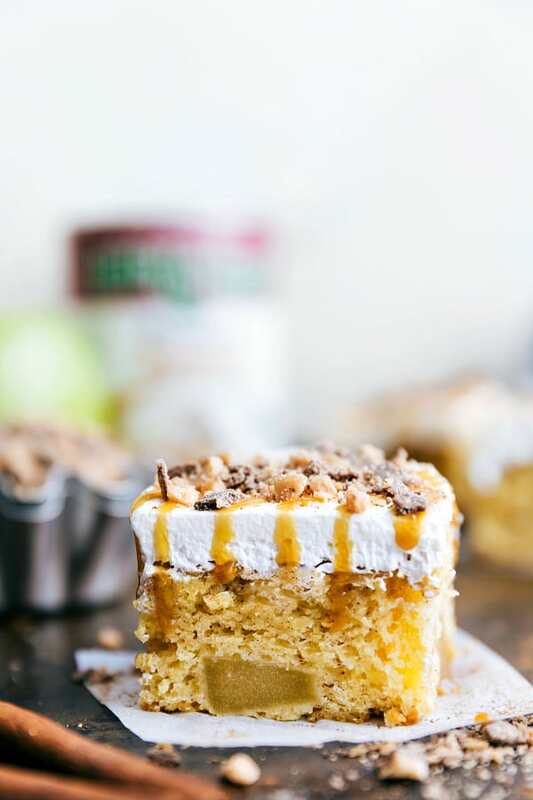 Topped with cool whip topping toffee bits and drizzled in caramel, this will become a new favorite! I might be borderline obsessed with the caramel apple flavor combination. They just go together so well and remind me of a fresh caramel dipped apple. This cake combines all of the things that I love. Our favorite apple filling from Lucky Leaf is baked right inside this super moist and tender cake. This cake is simple to make and requires little effort! 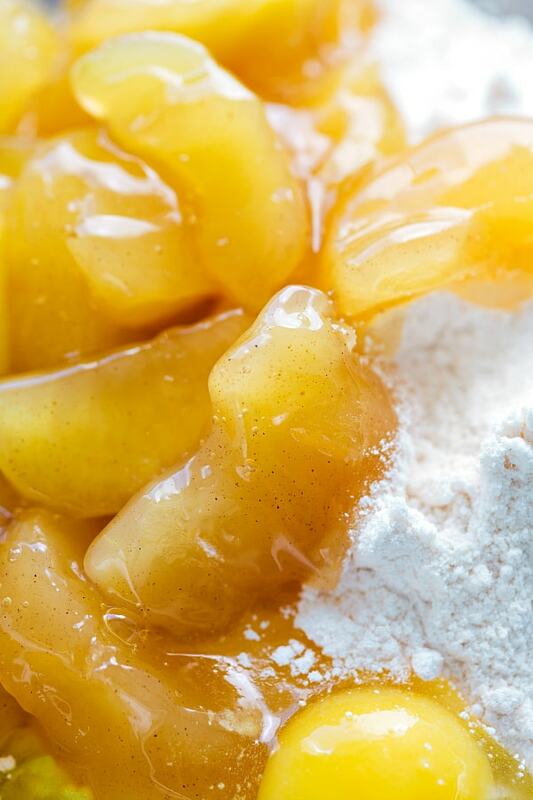 You start with a box cake mix and mix the apple filling right inside of the cake. You add some cinnamon to it to give it some spice and it comes out to be the perfect cake. I have yet to find a more premium and delicious can of apples. I really love using Lucky Leaf filling with all of my baking. The apples are perfect and packed inside of each can. 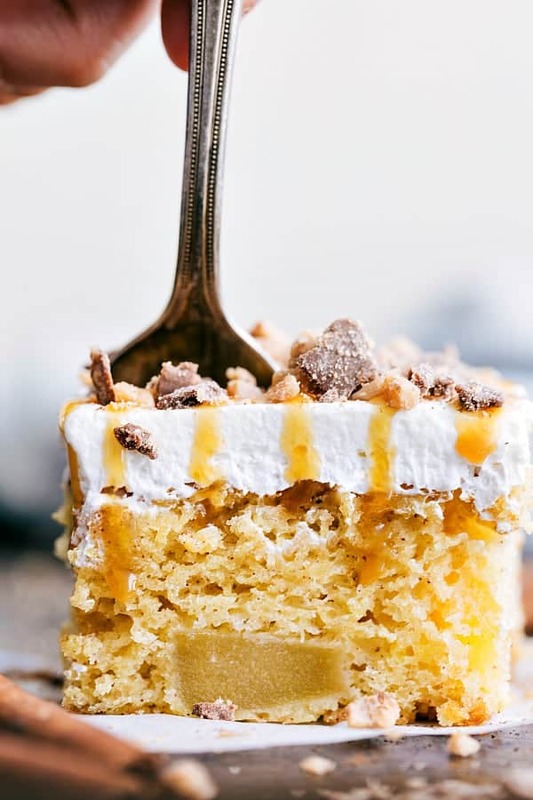 They really are key in adding a delicious texture and flavor to this cake. 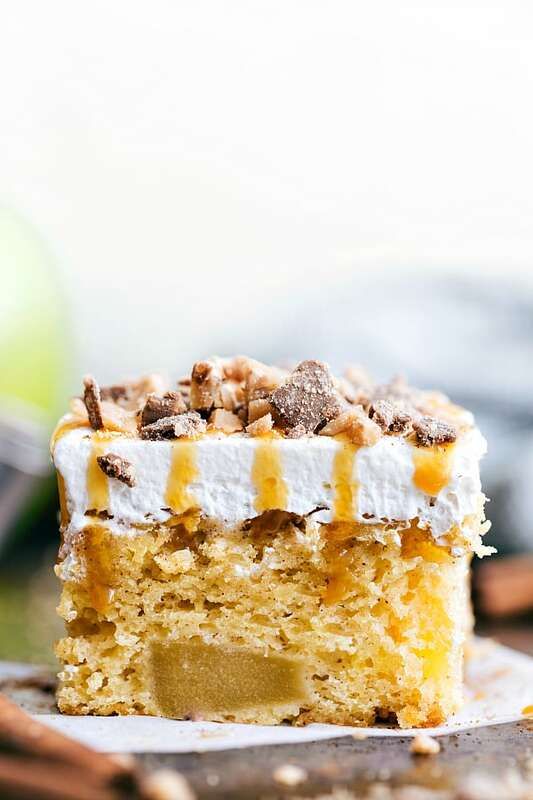 As soon as the cake has cooled you top if off with whipped topping, toffee bits and drizzle it in caramel. It is such a delicious cake and perfect for feeding a crowd. Everyone who will try this cake will rave about it! In a large bowl, add in the yellow cake mix, apple pie filling, eggs, vanilla, cinnamon, and milk. Stir together until just combined and smooth. Transfer the filling into the prepared pan and bake for 22-26 minutes or until a toothpick, when inserted in the center, comes out completely clean. Once completely cooled, spread the whipped cream evenly over the cake and chill in the fridge for 20 minutes. When ready to serve, cut cake pieces and serve on plates. Drizzle individual pieces generously with caramel sauce and a large handful of toffee bits. hey girl- this cake looks amazing! Y’all have a great weekend! Looks delicious! Can this be made with fresh apples? If so, how would I modify the recipe? 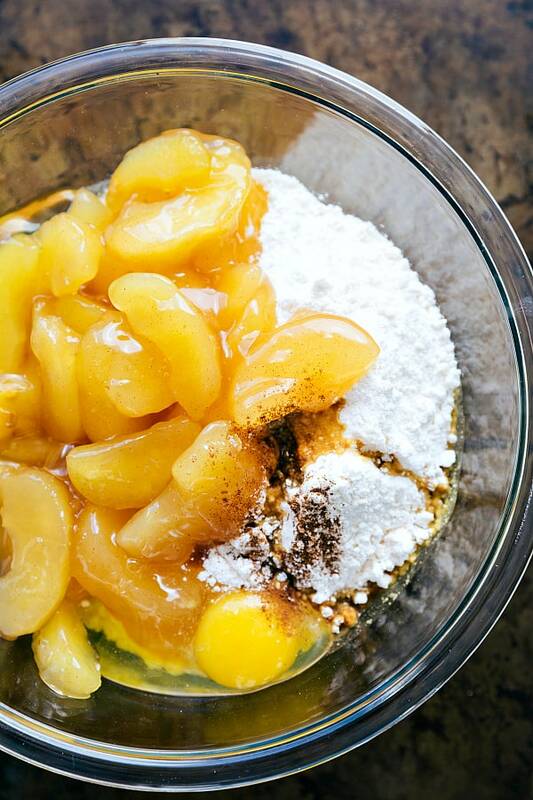 Do you prepare the cake mix first? Seems to be too dry with only the listed ingredients. Well, I just made my fourth Caramel Toffee Apple Cake. Talk about easy. It is now the family favorite. I made just as the recipe said and it always comes out perfectly. Thank you for giving us something different to serve for dessert. Dear Alyssa, I really enjoy your site very much ! Thank you for the beauty ! Not a big fan of apple but this looks delicious. Can I substitute apple with pineapple? Wondering if this would work well in other pans? Cupcakes, or a bundt pan? It sounds delicious, but I’d like to be able to present it in a slightly “fancier” way than a sheet cake.